Why compress your images for smaller pictures? Compressing your images allows them to be downloaded and viewed faster by your website's visitors. It also saves your valuable webspace and bandwidth and is overall a good practice when designing your website. 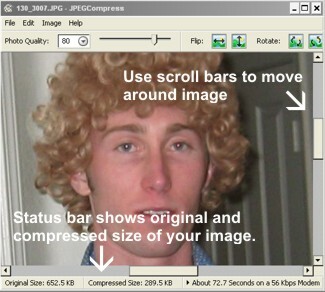 With the Jpeg Compress program, compressing and resizing your pictures is simple. Click here for the software developers website or just click here to download Jpeg Compress directly from our server. 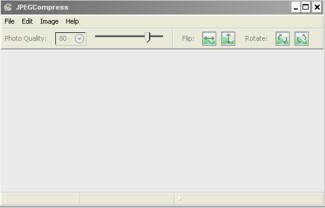 Then just install the program to your computer and follow the directions below to compress/resize your pictures for easy web viewing. Now that you have the program installed you will see a screen like this when you run the program. In the menu choose 'File' > 'Open' to open the picture file you want to work with. The image will appear full-size (which for higher mega-pixel cameras can be very large). Just use the program's scroll bars to move around the picture if necessary. 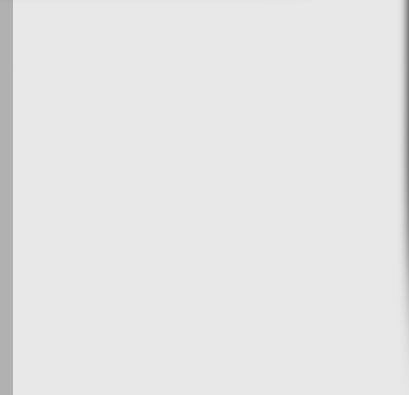 The status bar of the program will give you details about the file size of the image. 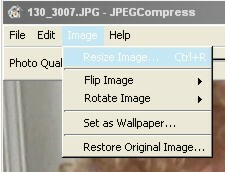 Both the original file size and the compressed file size is shown. Also the program will give you an estimate of download times for various internet connection speeds. Note: 1000KB (kilobytes) = 1MB (megabyte). Images published for internet viewing are best at a resolution 640x480 (pronounced 640 by 480) or 800x600. The first number is the picture's width (in pixels) and the second number is the pictures height. For example: a 1 megapixel camera produces images of the size 1280x1024 and a 2 megapixel camera produces images twice as large (2560x2048). Camera's take pictures this large so you can get a finer print quality. As you can see this resolution is much larger than we need it to be just to view the picture on the internet. So we are going to resize our image to 800x600. 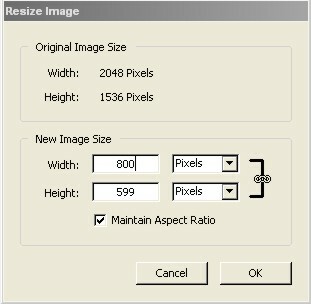 To resize our image choose 'Image' > 'Resize Image' from the menu bar. You will then see the Resize Image box. Your picture's original size will be listed and just type in 800 as the width and the height will be automatically scaled to match. Then click ok.
Now you'll notice your compressed image size is much smaller! We recommend a compressed image size no larger than 100KB for fast, easy to view web-images. 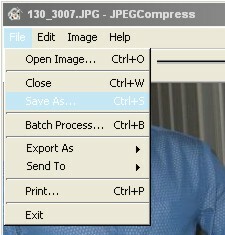 Now just choose 'File' > 'Save As' from the menu to save your new compressed picture. And that's it! You are ready to use this picture on your website.